Archivists from across Canada protested in Ottawa Monday, over a cut that will affect efforts to preserve Canadian history in small historical archives and museums in dozens of communities. 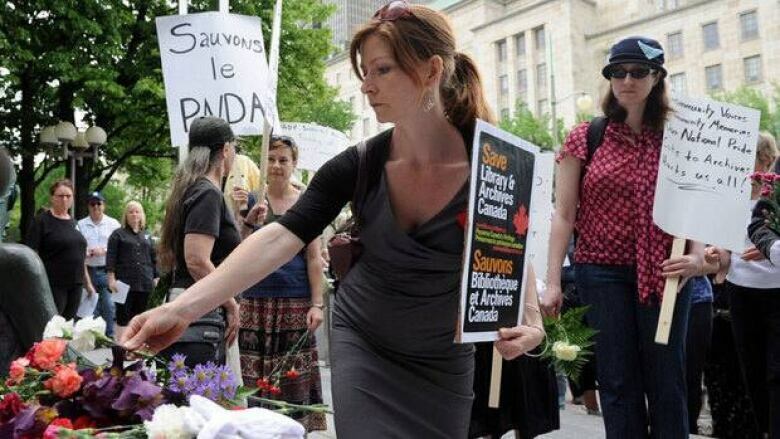 Archivists from across Canada protested in Ottawa on Monday over a funding cut that will affect efforts to preserve Canadian history in small historical archives and museums in dozens of communities. The National Archival Development Program — a federal grant program with a budget of about $1.7 million annually — was cut as part of $9.6 million in reductions to Library and Archives Canada. "It's seed money to help community archives across Canada help preserve and make accessible to Canadians our documentary heritage," Lara Wilson, chair of the Canadian Council of Archives, told CBC's Sunday Edition. The money used to be provided as a matching grant program for religious archives, First Nations archives and historical archives, she said. The fund was cut April 30. On Monday, the archivists called on the government to restore the program funding small archives and even increase that funding. Braden Cannon, special projects archivist at the Provincial Archives of Alberta in Edmonton, organized Monday's On to Ottawa Trek by archivists. He was inspired by the changes brought about by the historic 1935 On to Ottawa Trek. Unlike the earlier demonstration by unemployed men, however, the archivists didn't hop on trains, but flew in for a protest outside Library and Archives Canada. "I started to think about Canadian history and how other social movements had reacted to mismanagement from Ottawa and the On to Ottawa Trek popped into my mind," he said. He described the cuts to a program that has run in some form for 26 years "a really devastating attack on the archivist community." Many jobs will be lost and projects shelved, he said, adding that more than 90 projects received funding from the program every year. Cannon said archives provide government accountability, citing as proof the archival material discovered to support residential school victims' testimony before the Truth and Reconciliation Commission. In question period on Parliament Hill earlier this month, Heritage Minister James Moore defended the cut. "All the services that we operate right now to Canadians will continue, but they'll be done differently," he said. However, the archivists say even digitization projects making materials easier for Canadians to access are threatened. Too often, archival material arrives in dozens of dusty boxes or green garbage bags, so it takes time to sort through that material and restore it to some kind of order before researchers can use it or anyone can put it online, said Nancy Marrelli, archivist emerita at Concordia University. The council chair Wilson said she believes all MPs need to be educated about what archivists do and how archives work. It's not a matter of picking and choosing what to preserve, because it's hard to predict what will be useful in 50 years, she said. "Archives really are about the memory of our nation. They tell us who we are, where we've been, what we've done. It's a patchwork of pieces of the puzzle of who Canadians are," she said.